Last week I had the privilege of a V.I.P. 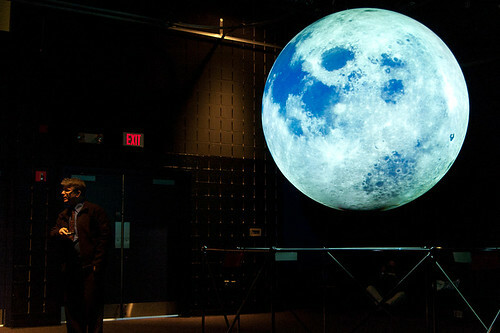 tour of the NASA Goddard Space Flight Center in Greenbelt, Maryland. It all started with a direct message from my friend Gene (@gbangert on Twitter). Gene and I had attended Yuri’s Night at NASA Goddard twice so far so he knows I’m a fan of NASA. I completed my registration for the event and waited to see if I would be chosen. I finally received the email that I was selected for the tour and quickly requested the day off work so I could attend. Since the tour was on a Wednesday I decided it would be best if I drove down to Greenbelt, Maryland the night before and grab a hotel. That would allow me to avoid any traffic issues that could arise between Harrisburg, Pennsylvania and Greenbelt, Maryland on a workday morning. Luckily I found a hotel just a few miles away. 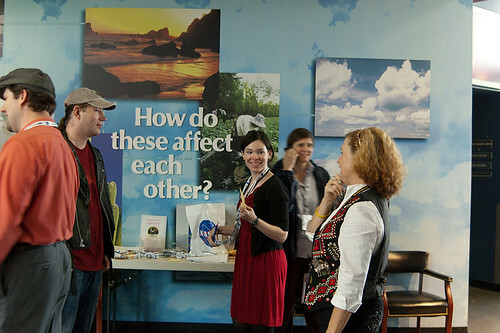 We all met at the NASA Goddard Visitor Center to start our tour. Above, Nina Harris (right) welcomes us and quickly remembers all of our names. Nina is a second-generation NASA employee. We pass the time awaiting Dr. Jim Garvin for the Science on a Sphere presentation. Unfortunately, Dr. Garvin was stuck in traffic but made his arrival as soon as he could. 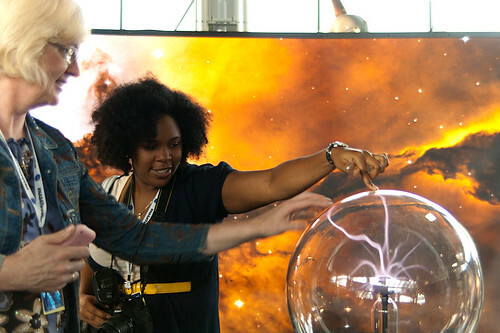 Dr. Garvin heads off the Science on a Sphere presentation. 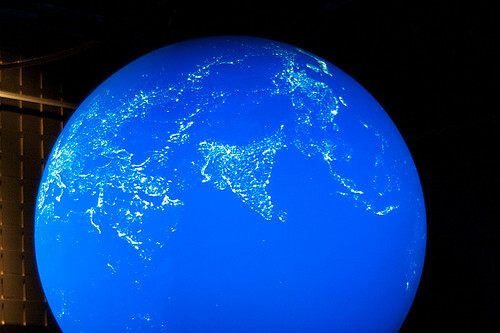 A 3D view of our planet at night. 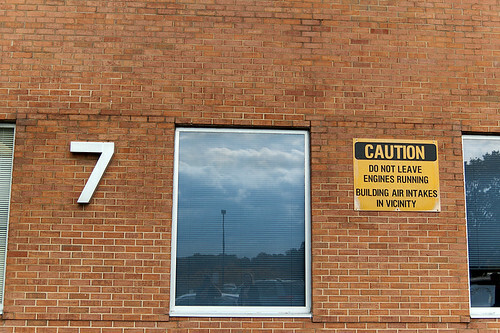 We begin our tour at Building 7. Nina explains that each building is numbered according to it’s age. Building 1 being the oldest, to the newest building which is in the upper 20’s I believe. Inside we find employees working in a small clean room. I love this shot. 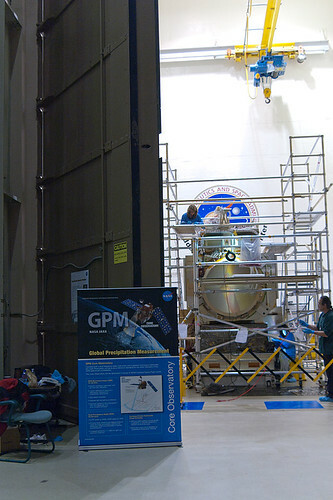 TIRS Satellite in the Spacecraft Test and Integration Facilities at NASA Goddard. 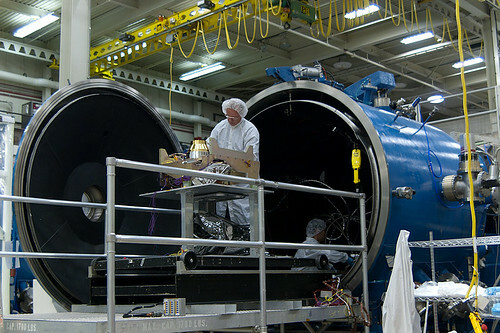 This facility contains cleanrooms for spacecraft integration and special chambers for environmental test of spacecraft. Thermal-vacuum chambers, a vibration platform, and an acoustic test chamber are located in this facility. There is also a full-scale model of the cargo bay of the space shuttle and a 4-story model of the Hubble Space Telescope. The Space Environment Simulator was huge! One of the coolest devices I have ever seen. This is used to test satellites to see if they can withstand the temperature extremes of space. From 302 degrees F all the way down to -310 degrees F.
This three-story high thermal-vacuum chamber located in Bldg 10 features a 27-ft diameter by 40-ft high vacuum chamber capable of simulating temperature and vacuum conditions for virtually any satellite launch or orbit environment condition. This test chamber, recently upgraded at a cost of over $3M with 8 periphery-mounted cryopumps (to insure no test item oil contamination as is possible with diffusion pumps); a turbo-molecular pump (for chamber pressures below .00001 to .0000001-torr); and a new state-of-the-art MIMIC Control Panel for easy, safe, and reliable operation of the chamber. Shroud temperatures within the chamber can be controlled to -90 to +75C using gaseous nitrogen and to -180C with liquid nitrogen. 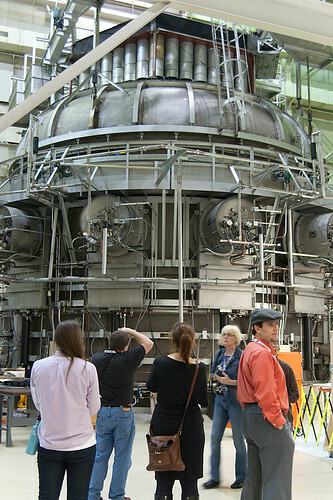 The High Capacity Centrifuge is used to test payloads to see if they can withstand the G-forces of a rocket launch. This device can test a payload up to 30 Gs. At this time the centrifuge is mostly used as a “closet” to store things. You can see the clutter sitting around the floor. 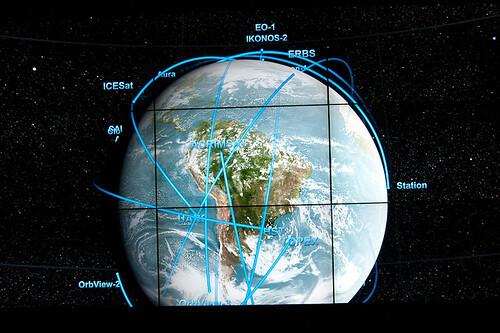 Employees are working on a way to refuel satellites in orbit which would extend their life. Once this is finished, they plan to make all of their research available to commercial opportunities which would bring down costs and find other uses for their research. 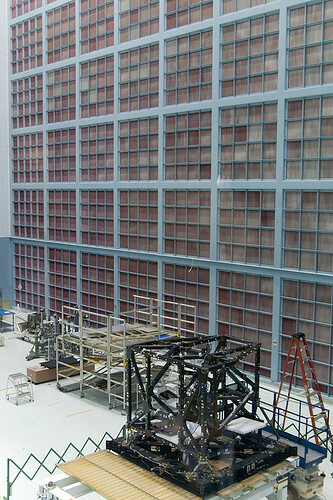 The Acoustic Test Chamber where a satellite is being prepared for audible testing. It’s true that in space no one can hear you scream. Blastoff, on the other hand, can make quite a racket, which is why engineers use the Acoustic Test Chamber. In this 42-foot-tall chamber, technicians expose payloads to the noise of a launch with the help of 6-foot-tall speakers. The speakers (more accurately called horns) use an altering flow of gaseous nitrogen to produce a sound level as high as 150 decibels for two-minute tests. That’s about the level of sound heard standing next to a jet engine during takeoff. The speakers are still audible — at greatly reduced volume — outside the chamber, even through the insulation of massive metal doors. The High Bay Clean Room (largest clean room in the world). A wall of HEPA filters. 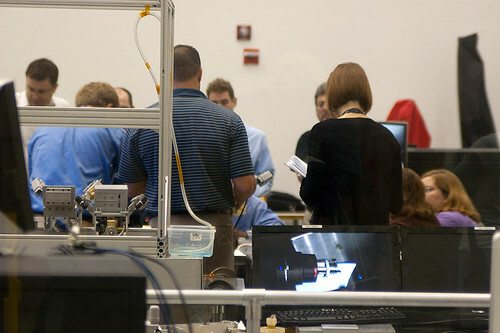 Before most Goddard spacecraft components are cleared for launch, they go through final checkups in one of many of the center’s clean room facilities. The largest, the High Bay Clean Room, can accommodate two space shuttle payloads at one time. 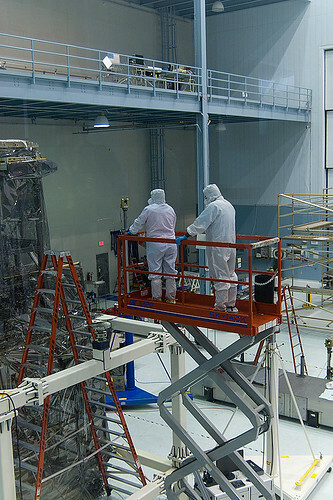 The High Bay Clean Room, often called the world’s largest, prevents dirt, dust and other contaminants from damaging spacecraft components, especially sensitive and carefully calibrated instruments. For example, unlike personal digital cameras, a smudge or speck of dust on the lens of a space telescope is extremely difficult — if not impossible — to clean, especially once the spacecraft reaches orbit a few hundred miles up. A robust ventilation system and an entire wall of air filters help protect against these contaminants. The clean room ventilation system circulates almost one million cubic feet of air every minute through 9,000 square feet of HEPA filters located along one wall. The filters are not your typical off-the-shelf HEPA variety from the local home improvement store. These are specially designed to last several decades. The Scientific Visualization Studio (SVS). This room consists 15 displays that are each run by a Linux system. Each system displays a video to the display and is in sync with every other system. All are served by a single Linux system that runs as a master. 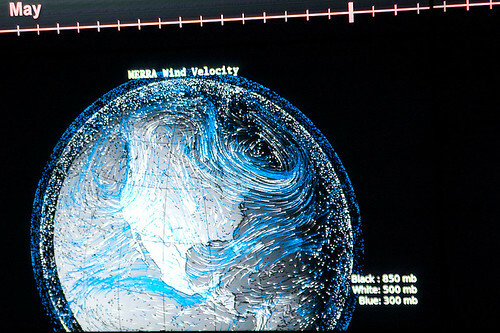 This allows for a huge visual display of data. 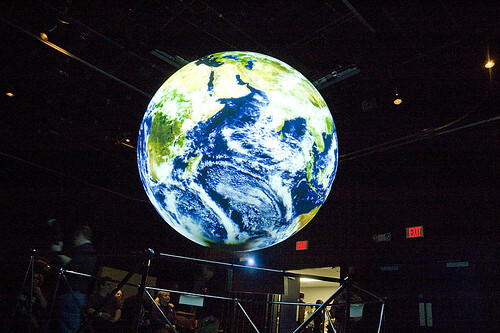 The Scientific Visualization Studio fosters scientific inquiry and outreach within NASA programs through visualizations (animations and artistic concepts based on scientific data). To that end, the SVS works closely with scientists in order to promote a greater understanding of Earth and Space science. 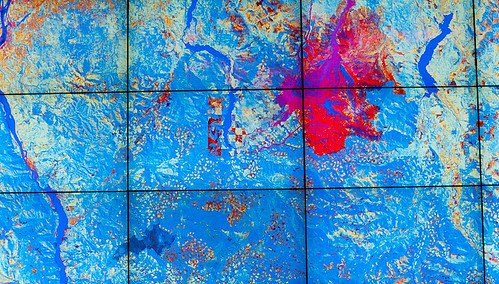 All the visualizations created by the SVS (more than 2,900) are accessible to the public. More recent animations are provided as MPEG-4s, MPEG-2s and MPEG-1s. Some animations are available in high definition as well as NTSC format. Where possible, the original digital images used to make these animations have been made accessible. Lastly, high- and low-resolution stills, created from the visualizations, are included, with previews for selective downloading. 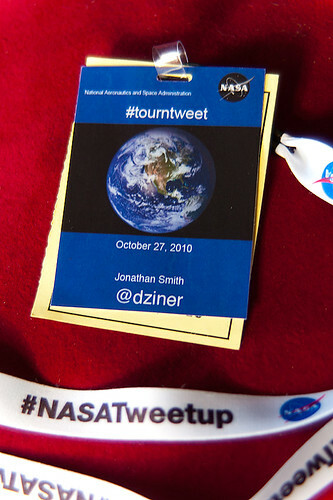 A friend invited me to Yuri’s Night 2009 this past weekend at the Goddard Space Flight Center in Greenbelt, Maryland. What a blast! Such a great event for fellow geeks. Where else can you mingle with others dressed in Star Wars outfits and have quality, intellectual conversations? Great music was provided by DJ Scientific and Middle Distance Runner. Human Spaceflight became a reality 45 years ago with the launch of a bell-shaped capsule called “Vostok 1.” The capsule was carrying Soviet Cosmonaut Yuri Gagarin, who took his place in history as the first human to leave the bounds of Earth and enter outer space. Exactly 20 years later, the United States embarked on a new era in spaceflight with the inaugural launch of a new type of spaceship — the Space Shuttle. Designed to carry a larger crew and large volumes of cargo to orbit, the Space Shuttles became synonymous with human spaceflight for an entirely new generation of young people. When the next 20-year point arrived, that generation (often called “Gen X”) laid a new space milestone by connecting thousands of people around the world to celebrate and honor the past, while building a stairway to the future. That event was Yuri’s Night, and it continues to bring the excitement, passion and promise of space travel closer to people of all ages, nationalities and backgrounds.